This week’s Speedmaster is something that came out of a dusty cabin in Finland. Aki from Finland received this Omega Speedmaster Professional reference 145.022 from his dad, after it had been collecting dust for years. Although the papers and original invoice have been lost, the watch still has the original red box from 1982. The Omega Speedmaster Professional 145.022 was introduced in 1968, the first watch to have the Lemania based caliber 861 movement. In comparison to the previous Speedmaster Pro 145.012 model, the most obvious changes are the dial, chronograph second hand and bracelet. 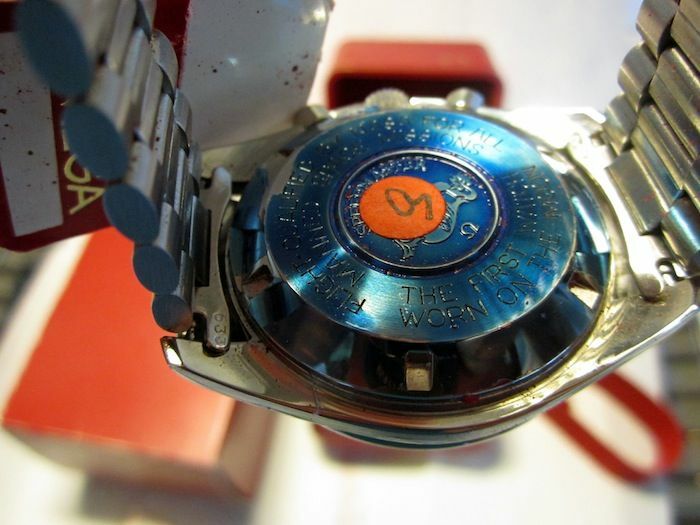 Under the hood, Omega stopped using the column wheel chronograph movement (caliber 321) and started using this shuttle cam movement caliber 861. The watch has a higher beat rate (21600 instead of 18000) and lesser parts. This would be an advantage in terms of accuracy and reliability, but it might also have been a cost-saver of course. You could say the 145.022 is the Speedmaster Professional reference that has been in production for the longest period in a row. 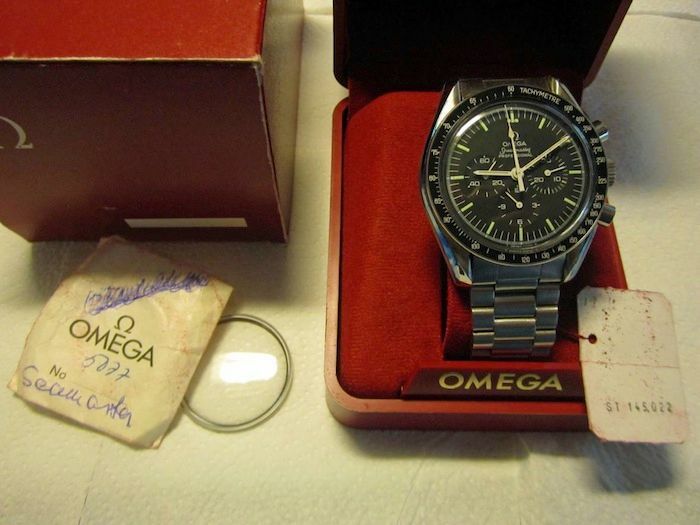 Omega stopped using the 145.022 reference and started to use the PIC indication system for watches (this watch is now the reference 3570.50) somewhere in the 1990s. This Speedy Pro 145.022 reference is also considered to be the Moonwatch, as the reference 357.50 is now and the 145.012 was before. The bracelet on this model is the reference 1171 with ref.633 end pieces. A folded stainless steel bracelet that was also introduced in 1968 and used until the ref.1450 (President-style) and ref.1479 were being used. If you look at the dial of the 1982 Speedmaster Professional that Aki received from his father, you’ll see that the dial and hands contain the tritium luminous material (Omega discontinued the use of tritium on Speedmaster Pro watches in 1997). What isn’t very clear on this picture, is the fact that the sub dials are sunken in the dial and have a circular grain in them. Our photographer Bert Buijsrogge did a few macro shots on his 1971 Speedmaster Professional to show you what I am talking about (click here). The Speedmaster 145.022 was also the first reference to have the famous – and much discussed – engraving on the caseback of the watch. 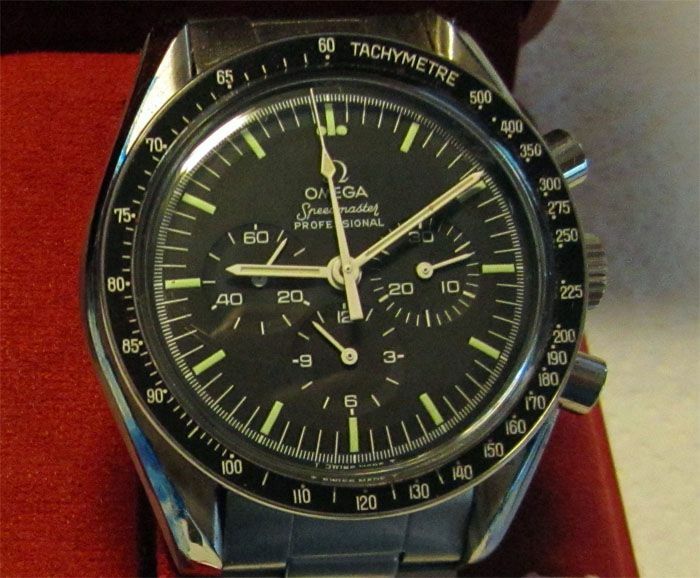 Although the first watch worn on the Moon was a caliber 321 Speedmaster (click here), it is safe to say that its successor is definitely a ‘Moonwatch’. The engraving is rather a tribute to the choice that NASA made in 1965 than to say the caliber 861 ‘Moonwatch’ was the first watch worn on the Moon. Anyway, the inscription on these casebacks come in various shapes where the round version (like the one below) is the most common appearance. An overview on Moonwatch caseback inscriptions can be found here. As you can see, Aki’s Speedy Pro still has the blue protective stuff on the caseback and some kind of sticker. I assume this sticker is something like a QC sticker put on there by Omega. Although the watch might appear to be a bit rusty, the owner assured us that it is just dust. Aki said that although the watch has been in the cabin for years, it did receive the occasional wind as his father was told to do this in order to keep it in good shape. A big thanks to Aki for playing along with our Speedy Tuesday and to Ashley from the OmegaForums for the heads-up. Make sure to LIKE our Speedy Tuesday Facebook page and enjoy our daily feed of Speedmaster photos, articles and news. Looking for a modern Speedmaster Professional ‘Moonwatch’ reference 3570.50? Click here and make sure to mention FW when purchasing (and receive additional advantages).